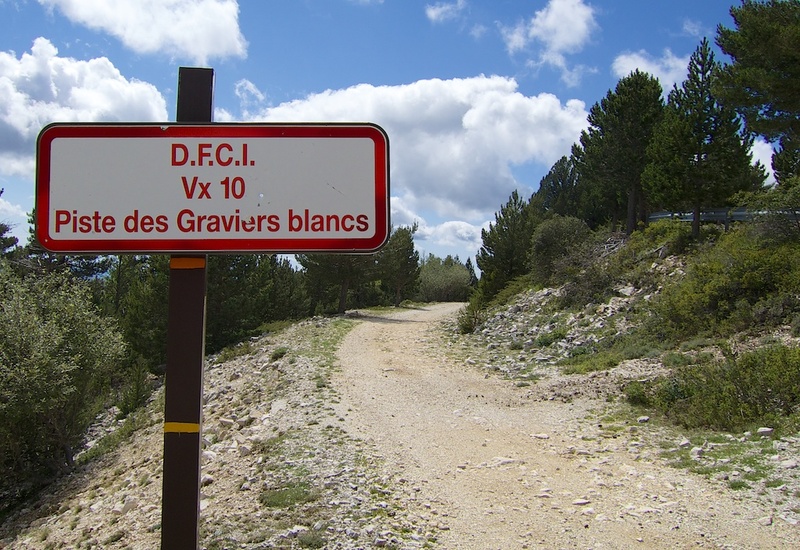 Many cyclists have heard of the Club des Cinglés (Crackpots) du Ventoux. The basic idea is to cycle all three sides in a single day. Difficult! Recently, the idea has been extended to include a fourth “forest” route. I did once somehow manage to climb all three sides in a day – details here. 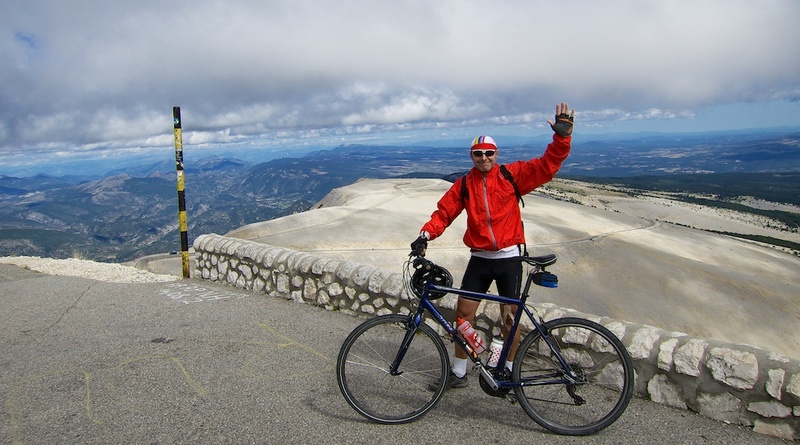 But my favourite Ventoux adventure: seeing the sunrise at the summit – details here. However, this 4th Forest route suggested by the Club shares 13 kilometres of the paved road – wimps! I had a similar but more remote option in mind that wouldn’t join the paved road until the final 4 kms. Both options are marked and explained on the map at bottom. I started just below Bédoin, the start of the most famous paved option. There is probably a better way to find the start of the gravel road, but it is just a little above town. I marked on the map where I joined it. Much of the first few kilometres are exactly like the top photo. It’s a wide, deserted road – I saw no-one. It had been freshly “re-graveled” and was thus at times quite difficult: slippery, bumpy. Harder than a typical old mountain gravel road. It’s never ridiculously steep or technically crazy – it’s longer than the paved way. Happily, after a few kilometres the surface became easier: less new gravel. After Sixteen kilometres, I arrived at a four way intersection. I am quite certain that the Club des Cinglés suggests their forest road as it is just about do-able on a road bike – if you are not too fussy. Whereas the Piste des Graviers Blancs that I rode is certainly a bad idea on a road bike. FWIW, I was using 700-35c tires. At this intersection, my route joins up with the Club’s route. Again, marked on the map below. There is also a way to get to Chalet Reynard from here. At the intersection follow the sign for “rte 110 Piste de la Tête du Chauva” – Track of the Bald Head. Nice! The surface is basically the remnants of a paved road, relatively flat, easy riding, curving around towards Mont Serein. As often is the case, it was very, very windy and cold at the summit. Overall, this was a fun adventure. I loved the deserted nature of the climb and the improving views as I got higher. 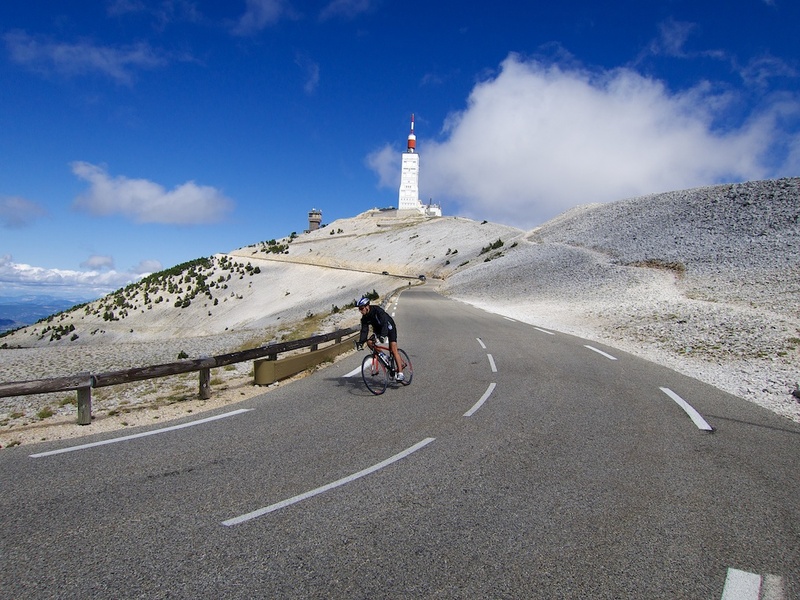 In the busy month of August there is something special about having Mont Ventoux all to one’s self. 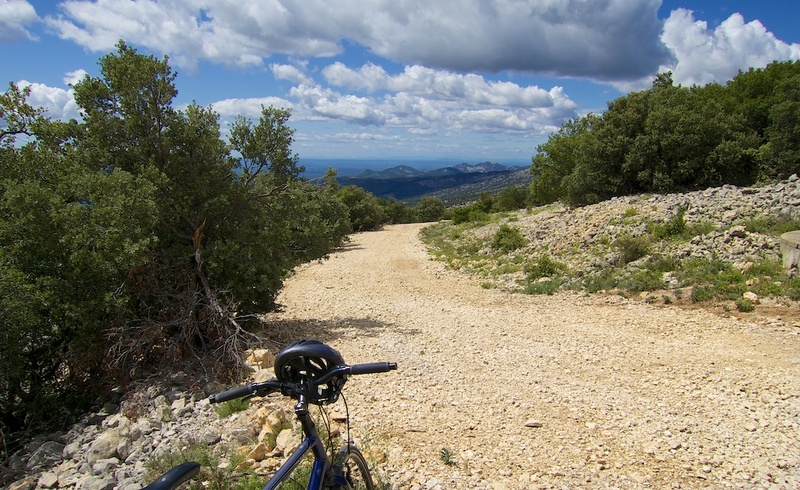 A fun, deserted, unpaved option up the legendary Géant du Provence. Going to drive down to Spain next week and I’m thinking of doing the three climbs of Ventoux, I have completed the classic single climb twice before how long did you allow for the climbs and how long did it actually take. Steve, it really depends how strong you are. I stop and take lots of photos and descend like a wimp. It took me a little over 8 hours. Will sorry for taking so long to get back to you, only got back home this weekend I did manage the three Ventoux climbs, it was very busy with at least three organised events taking place I felt really good all day except for the last 2km on the last climb. Took me 7hr 23min moving time 7hr 50min elapsed time I’m very pleased with that. It was a great day warm at the bottom and not that much wind. Also got managed 200km audax in Spain all in had a fantastic month with lots of climbing. Well done and thanks for the photos Will, they give us some idea as to what the surface is like. I did the Cingles in June of this year and apart from not being able to clip in from Bedoin to Maulecene everything else went well for me. 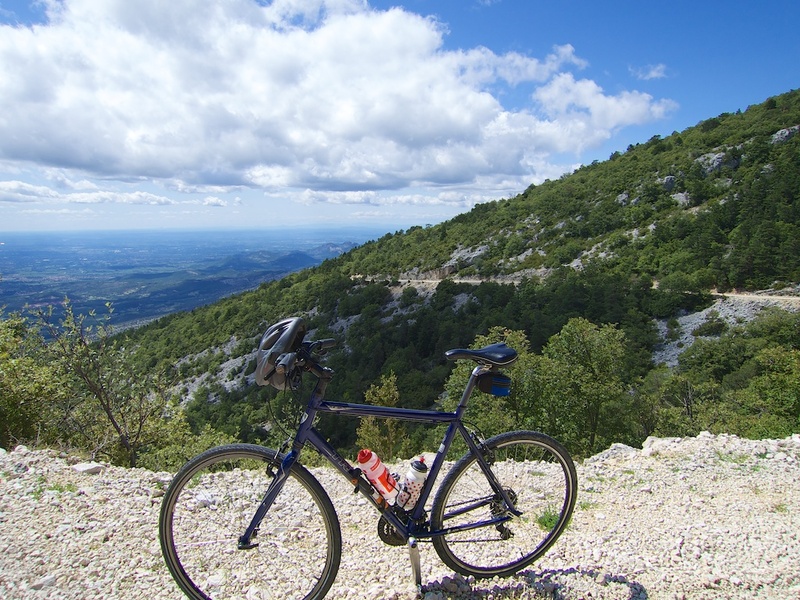 I’m looking at doing the Galerien next year though, as you may well know climbing up Ventoux via its 4 routes, which includes the forest. My question is, is it possible to do it with a road bike but with thicker tyres say 28mm’s instead of the 22 I did the Cingle with? Yes, I think 28mm would be more than fine on the forest route suggested for the Galerien. I think it’s likely that they suggest a different, easier forest route than the one I did is precisely so people can do all four sides with the same bike. Mates and I are planning on doing the three ascents in July this year but having just heard of this forth route and being a huge CX fan I’m thinking I’d love to add this route to my day. Do you think a standard CX bike with 33 tires and 36/28 as smallest gear is suitable for this leg? Not sure yet whether to then swap bikes or just swap to wheels with road tires for the next three legs. I only ride canti brakes so worried the descents may be a little hairy. it’s rocky … see photos, but going up makes it less of an issue. No good for road bike, but 33c should be great. (I am no expert). It’s a great route and FAR better than the 4th way suggested by the official Cingles club. Good luck. 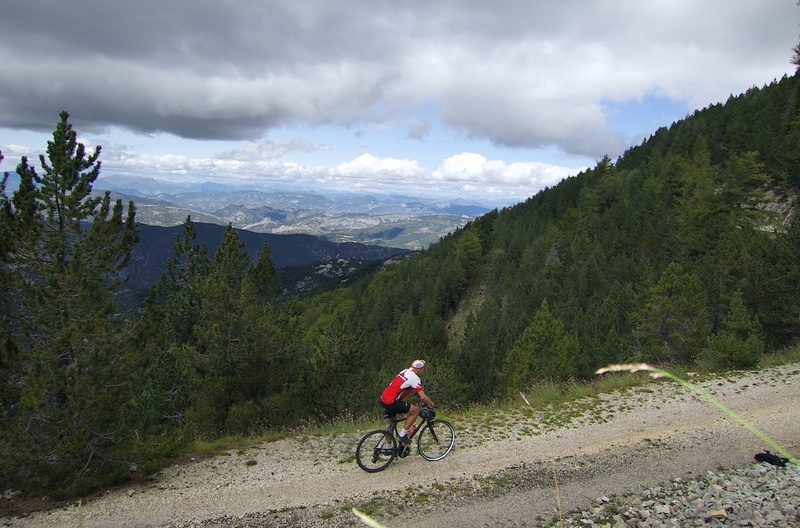 Inspired by your article Mont Ventoux: A Fourth Way Up (By Mountain Bike) we thought this ascend of the Mont Ventoux might suit us more than the paved roads with cars and motorcycles. As we like the quietness of unpaved roads and we are not afraid of gravel and some rocks. In reality this road on our bikes with packs was quite heavy. We had warm weather and our pace was slow. So our water supply 2 liters per person was too little. But this Fourth Way Up is a nice challenge! Check out our video https://www.youtube.com/watch?v=yV4j3j6vo1w . Just back from a trip to France. Did this route and it was great. The hardest part was finding the correct start. Even then I was only sure I was on the right road once I got to the intersection with the tete Chauve. Took 2 hours thirty which was good enough after all the wine I drank the night before. Thanks for this post. I will make my own in a day or two. Made a strava Segment as there did not seem to be one from where you stared.